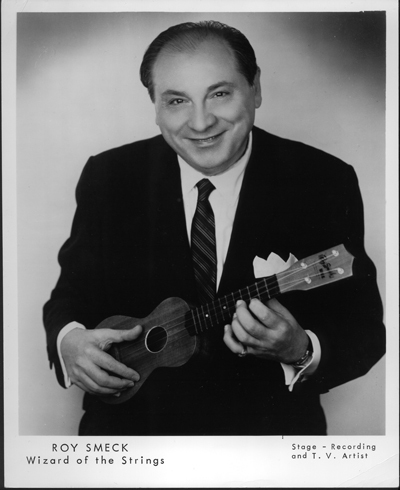 Roy Smeck was an amazing virtusoso player of the ukulele. Let's see if we can use some of his 'tricks' in this piece! Before we start learning this piece we need to learn a new way to play the ukulele! We are going to learn to play with the finger nail and finger pad of our 'pointing' finger. 1. POINT up the strings towards the head of the ukulele with your playing hand. 2. 'BREAK' or bend your wrist so that you're now pointing down at the floor. 3. CURL your pointing finger underneath. Now...strum DOWN through the strings using the back of your finger nail. Do this slowly and carefully at first! Next...strum UP through the strings using the pad of your finger. Down, down, down, down, down-up, down-up, down-up, down-up. 3) Now let's try and incorporate some Roy Smeck tricks! The 'Lift!' - Play the chord of 'C' 5 times and then life the ukulele upwards using two hands, quick up and down! The 'Blow!' - Play the chord of 'C7' 5 times and life the ukulele towards your mouth, while flat. Blow across the sound hole, once and HARD! It should make a deep pitched sound like a boat's klaxon? The 'Swipe!' - Play the chord of 'F' 5 times, then flip the ukulele onto its front and 'slide' the palm of your right hand up the back of the ukulele towards the neck. It should make a 'squeak' type sound? The 'Flick!' - Play the chord of 'F' 5 times and then 'flick' the wood of the ukulele below the bridge with your second finger...careful now, it can be a little sore! 5) Now! All you need to do is put ALL that together, using the chords to make our 'Traditional' style ukulele piece! EASY!